Raise your hand if you love mid-October! The green leaves have turned a fiery red and majestic gold, and we’ve grown accustomed to the schedule changes that the new school year brings. The kids are excited about trick-or-treating, and we’ve all been enjoying the delicious weather and lunar-lit nights. Unfortunately, we’re also approaching the peak of cold and flu season. Letters have already come home in my kiddos folders indicating possible exposure of everything from pertussis (yes, vaccine-preventable!) to lice. In an ideal world, all parents would keep their children home when sick, kids would never put their hands in their mouths, and every single classroom would have a sink. 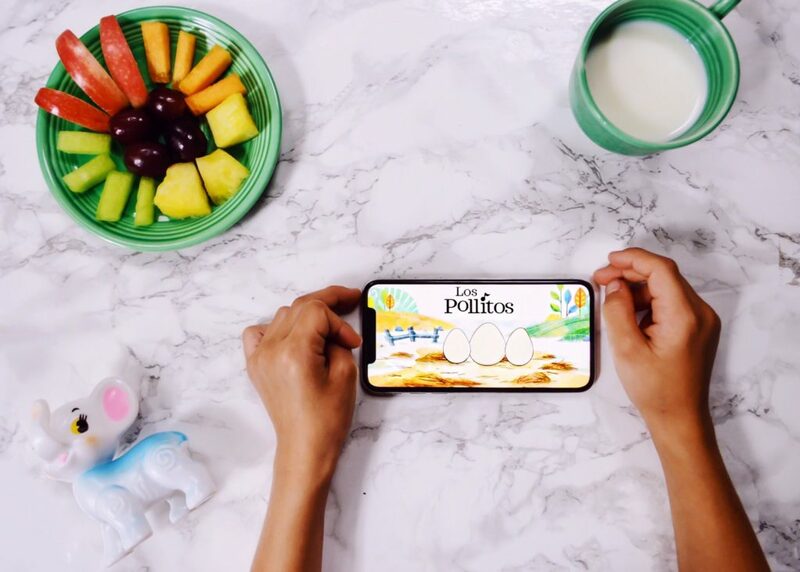 While we can’t become overly consumed with germs – there are steps that we can take to keep our families and communities healthy – while allowing our kids to thrive and focus on the important work in childhood play and learning. According to the CDC, one of the best ways to stay healthy, especially during a flu outbreak is frequent hand washing. And if you’re a parent – you never really never know what your children may have touched! When soap and water are not available in the classroom, the OmniPod™ Hand Hygiene System with Germ-X® is the perfect solution – effectively eliminating germs (up to 99.9) percent. 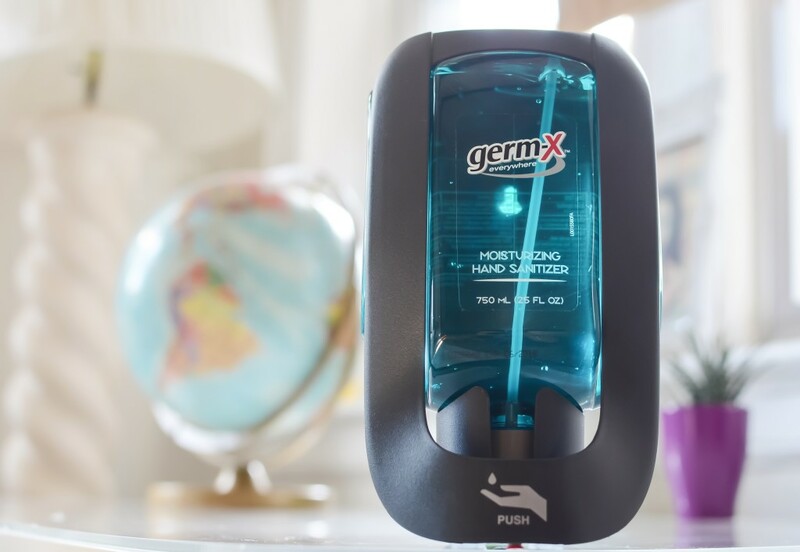 While many of us wouldn’t send our young kids to school with individual hand sanitizers – the structure of the OmniPod™ Hand Hygiene System with Germ-X® offers application in a controlled and trusted manner in a classroom setting. As a parent, I trust that my own kiddos will get a dime-sized amount and not a massive quantity from the dispenser. The ADA compliant design has a secure locking mechanism and can dispense liquid, gel or foaming hand soap. The sturdy and easy-to-use bracket system locks in a full 750mL bottle – that can simply slide out to be recycled and replaced when empty – and the small footprint conveniently and easily mounts anywhere. We all know how much money teachers end up spending out of pocket on school supplies, and as sickness begins to spread – we’re reminded that hand sanitizer shouldn’t be overlooked. Grab the OmniPod™ Hand Hygiene System with Germ-X® on Amazon and include it in that teacher appreciation basket. And if you’d like to win one to send to your child’s classroom – just leave a comment below. We’ll randomly pick a winner to send one off to next week. Also, use code PROMOGERMX16 for 20% off your purchase. Wishing you a healthy and happy Fall! I’m rarely without a small notebook and pen in my bag. Some think it’s old fashion, but I believe in writing things down. In many ways, writing channels my creativity, requiring a presence in thought and handwriting (which happens to be horribly messy by that way). That said, in an increasingly digital world I want my kids to believe in the power of the pen and master their own style of handwriting (hopefully neater that mine!) – as it really is a unique and integral part of themselves. 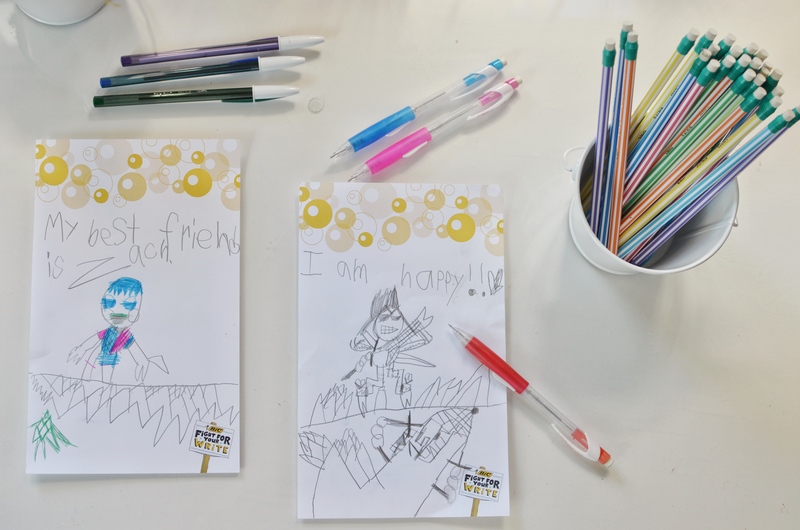 And so we joined BIC in sparking excitement for the back-to-school season and their mission to remind parents of the emotional and cognitive benefits that handwriting has in shaping children. With fantastic packs of BIC pens and pencils, my kiddos were eager to join in the early morning writing fun. Principal for a day? 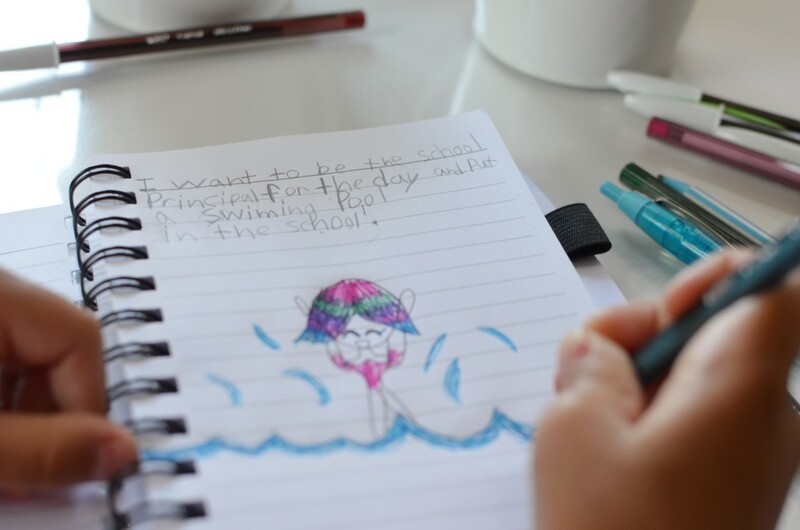 The big girl would absolutely add a pool to her school and dye her hair in a kaleidoscope of rainbow colors to celebrate the occasion. And her love for reading and Harry Potter is still going strong. She carries her beloved books everywhere – a trait that I adore. Our soon to be first-grader is getting super expressive in his drawings along with his writing – which is always a fun incentive for working hard. His growing confidence is precious – and taking the time to work on handwriting helps to show him his incredible potential. 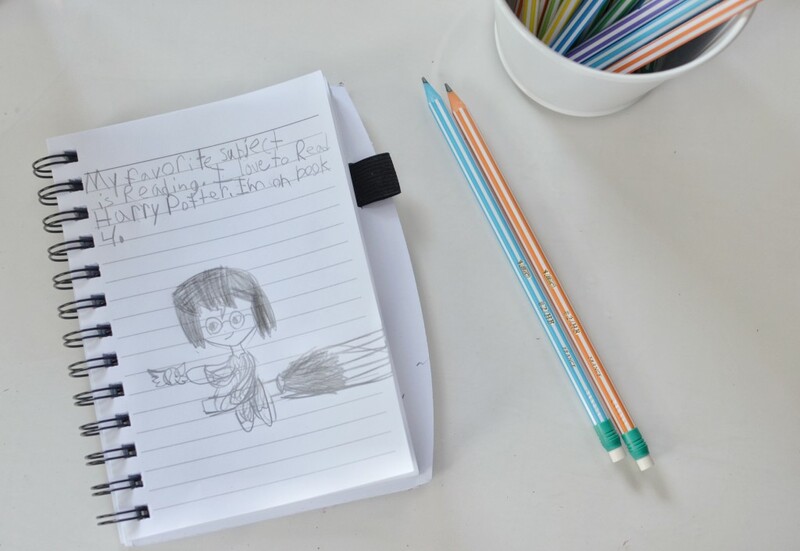 BIC’s Velocity Slide Clic Mechanical Pencils have proven strong enough to withstand the pressure of our eager six-year-old pressing down while writing (perhaps a bit too hard!) 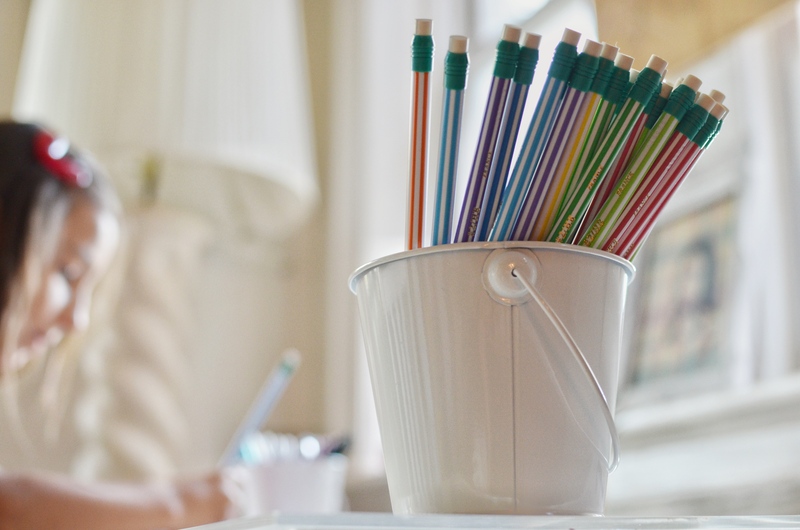 without breaking – and BIC’s EXTRA-Fun #2 Pencils with stripes add tons of bright two-tone fun to the kids’ work area. 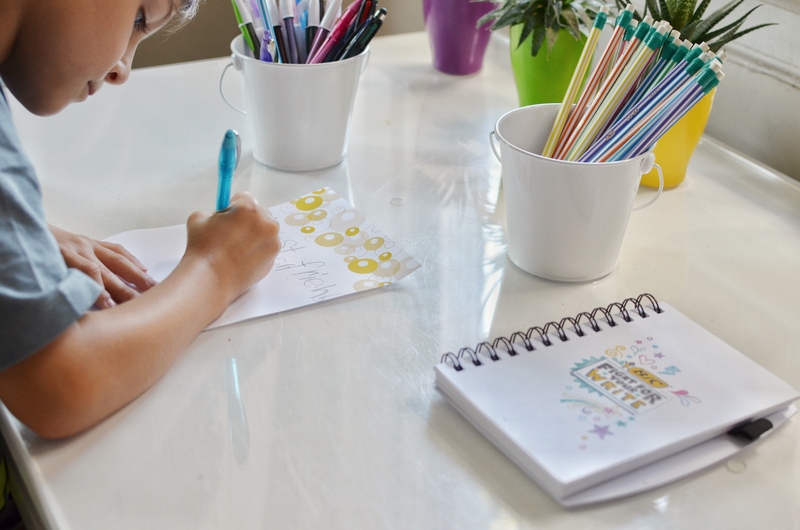 We’re also huge pen fans and found greatness in BIC’s Cristal Xtra Precision Ball Pen and their 4-color Stylus and Pen – which is entirely nostalgic of my childhood, featuring interchanging pen colors (that you press down to switch!). We’re excited to help share BIC’s Fight For Your Write mission in partnership with AdoptAClassroom.org to help give children the tools they need to thrive in school. 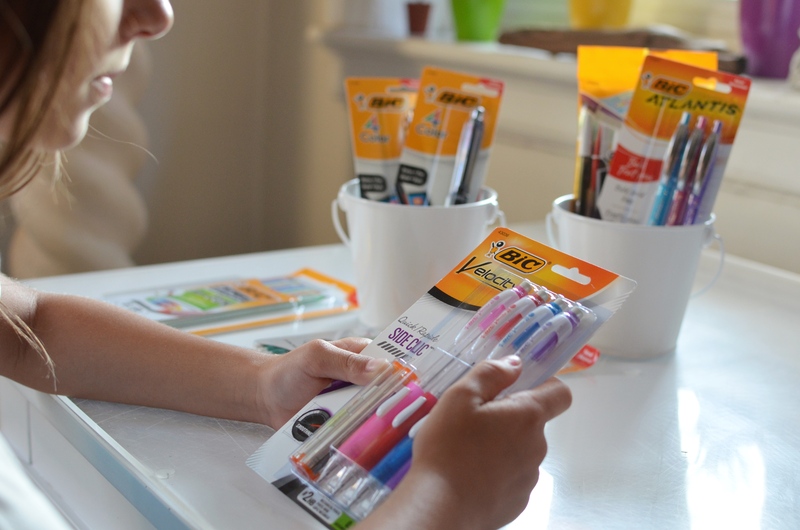 For every signature that BIC receives for its pledge to celebrate handwriting, BIC will donate a pen or pencil with up to 200,000 products. Join us in BICFightForYourWrite.com‘s contest! What would your kid(s) do if they were principal for a day? Have them write down their ideas for entry to win a $10,000 scholarship! Hurry up because entry submission ends on 8/15 (no purchase necessary, U.S. only, 21+) – find official rules and entry options on BIC’s website. 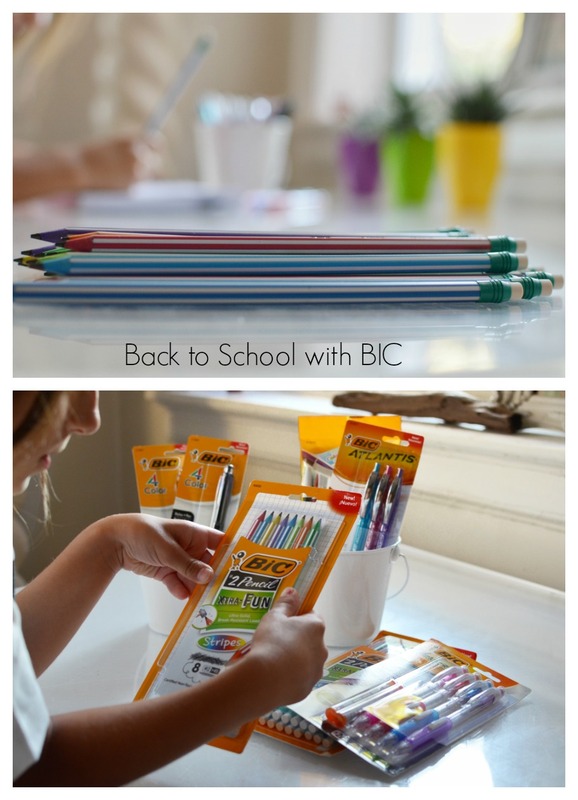 Wishing your kiddos a smooth transition back-to-school! This post is sponsored by BIC. Opinions, as always, are my own. Our children, our truest markers of ticking time, have a way of reminding us just how fleeting these precious moments of childhood are. It was just yesterday that I wrote this birthday letter for my son – but then I blinked and a few more years passed. And all of the sudden, while making memories in what feels like a beautiful and chaotic mess, the days somehow slip into years. I know this truth, as the mother of an eight and now six-year-old. My kids have big dreams. 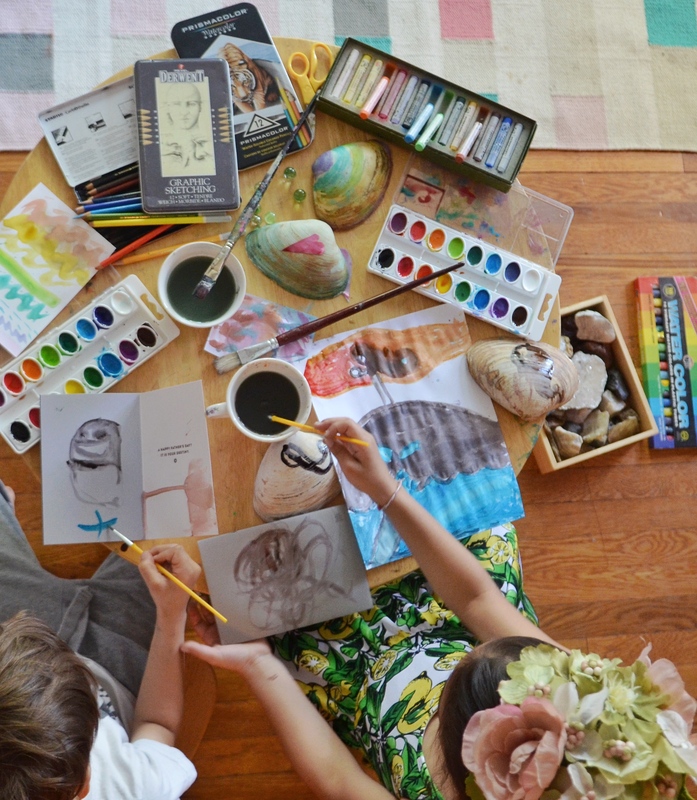 Our oldest has her sights set on being an inventor (who will create a teleportation device), a scientist, and an artist. While the little guy dreams of being a chemist (the kind who mixes colorful potions) – and a LEGO builder too. Like all parents, we want our kid’s ultimate career dreams to come to fruition – but in the midst of the financial responsibilities that come with adulthood it can be concerning to think about paying for our children’s college education when many colleges currently charge more than $60,000 per year. What will the cost of college be in 10 to 15 years? That’s why it’s crucial for parents like us to save for two college educations in the most efficient way possible – with a NY 529 Direct College Savings Plan for each child. 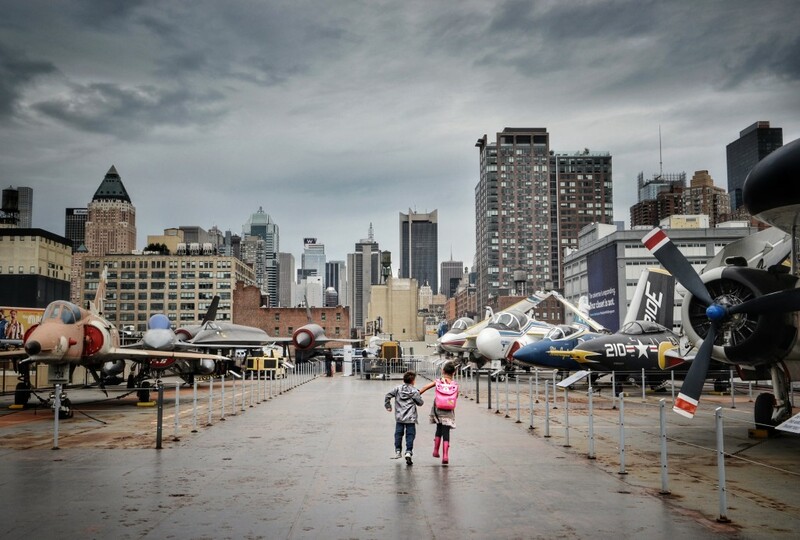 I jumped at the opportunity to meet with the plan’s financial team along with NY’s First Deputy Comptroller Pete Grannis, at an intimate event at the Intrepid Museum, hosted by Momtrends Media. When choosing a 529 plan to use towards your child’s two-or-four year university, accredited vocational school, or postgraduate program along with supplies and accepted expenses (computers, room and board, etc.) – it’s important to find out if your state offers tax deductions for 529 contributions. 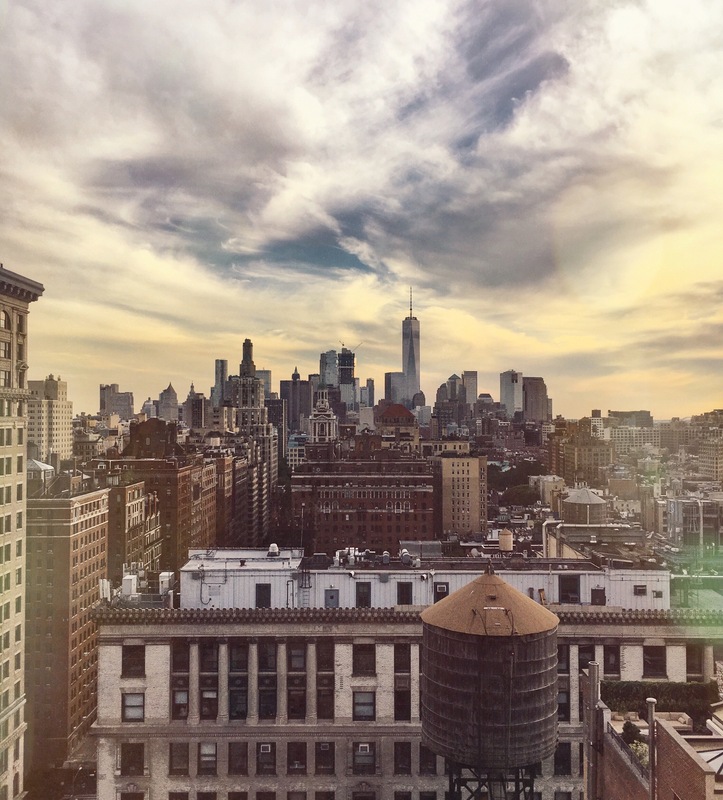 While states including New Jersey do not, New York 529 plans offer tax benefits. 529 account funds can be used in any state – they are not limited to the state sponsoring the 529 plan. Account contribution limits for 529 plans are generally high – from $200,000 to $300,000 or more, depending on the state. The Direct Plan, accommodates contributions up to $370,000 on behalf of one beneficiary. This amount includes all New York-sponsored 529 savings accounts held for the same beneficiary. Also, most institutions only count 6 percent of the total 529 funds as usable when determining financial aid eligibility. In comparison, 20 percent of traditional savings account are factored into the financial aid eligibility process. Many people can open a 529 account with as little as $25! Including, not only parents but other relatives and friends – as long as U.S. citizenship or resident alien status is established. The account owner selects the beneficiary, investments and how the funds will be used. If you’re a New York State taxpayer, you can also benefit from the state tax deduction. In lieu of toys that will be long forgotten, family and friends can contribute to kids 529 accounts creating a lasting gift that will grow over time. To learn more about these powerful savings vehicles where earnings grow federally tax-deferred and where qualified withdrawals are tax-free – visit www.nysaves.org. For Financial AID information visit www.hesc.ny.gov. This is a sponsored post. Opinions as always, are my own. Spring break is officially here! 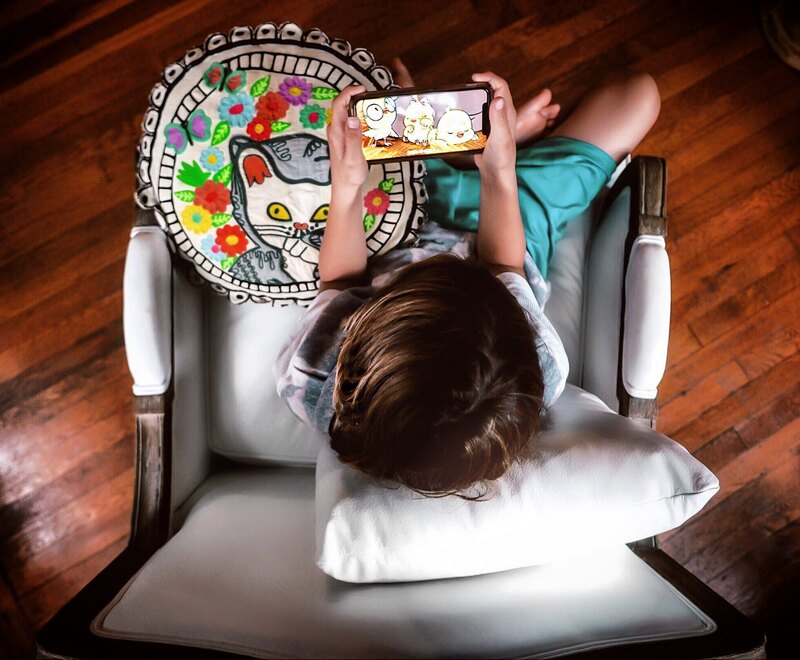 Since the kiddos are home for the week, we’re sharing fun and educational ways to keep school children occupied and entertained. 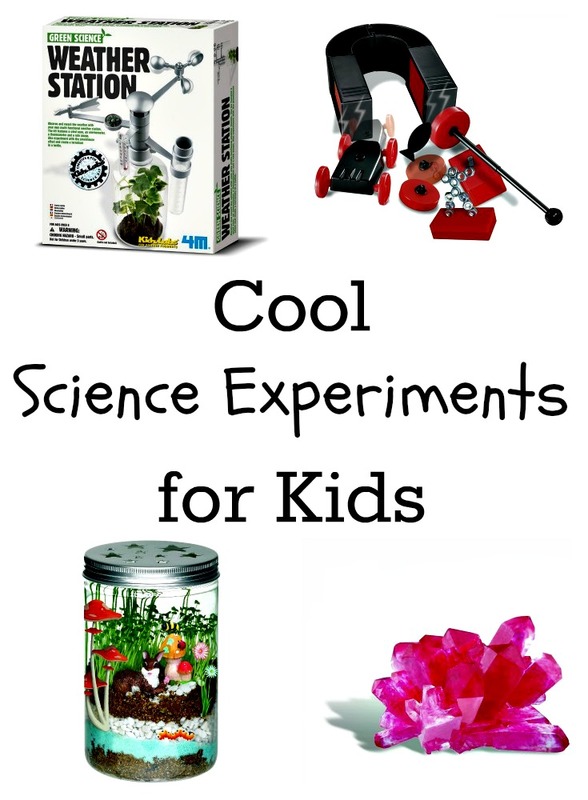 I’ve put together a list of some cool science experiments for kids along with educational kits to help pull them off. 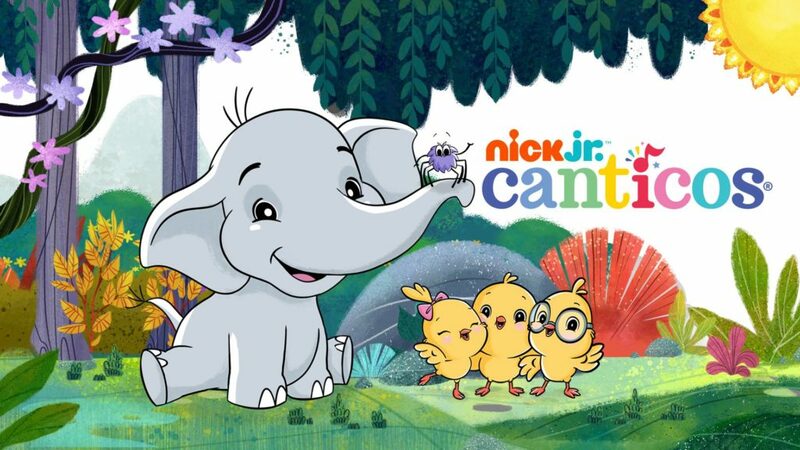 Check out some of our new favorites below! A crystal growing kit is a fun experiment for kids of any age. One kit includes enough materials to create seven different crystal experiments. It also includes a special display case for the kids to admire their gleaming creations well after growing them. Spring is finally here, the plants are starting to peek up from the soil, and it’s a perfect time to start an indoor terrarium. Teach your kids how plants grow from seeds into full-size plants. This kit includes two little figurines to dress up the terrarium and glow in the dark stickers to make it stand out at night. Your kids will have so much fun watching the plants grow more and more every day! This kitchen science experiment kit includes six different science experiments in one. The best part is that they use common ingredients found in almost any kitchen. Experiments include creating electricity from lemons, launching a rocket with vinegar, writing invisible messages and more! Kiddos will love learning about how magnets work with a bunch of experiments in this magnet science kit. Build a magnet-powered car, a compass and more! For added fun gather up a bunch of metal nuts and use the powerful horseshoe magnet to magnetize them into different standalone shapes. This weather station is super cool! It allows you to observe and record weather conditions. Equipped with a fully functional wind vane, anemometer, a thermometer and a rain gauge. Kids can also use the kit with a recycled bottle to create a terrarium and learn how greenhouses work. Have any suggestions to our list? Do chime in below!